Continental’s Conti EcoPlus HD3 gets EPA certification. Long haul trucks now new tires to choose from. The world of green low roll resistance tires is confusing for most drivers. Everybody wants a tire that helps them save energy, while raising performance and at the same without sacrificing comfort. The problem is that all these qualities usually impede on one another. Low roll tires must meet a lot of constraints and requires careful engineering, something Continental’s Conti EcoPlus HD3 hopes to have achieved. Building A Tire. Making a tire is not an easy thing. Contrary to common belief, a tire is not a single cast of rubber and threads. A tire is assembled in many stages and what makes up the wall is different from the belt, so on, so forth. A Michelin engineer told me once that you don’t make a tire, you construct it. This lead to an interesting conversation about what makes a low roll resistance tire. What Is Low Roll? In order for a tire to be as efficient as possible, it needs to be inflated with enough pressure to limit the natural deformation that happens as it rolls over the pavement. While the idea of over-inflating a tire has occurred to most of us, we are also aware that the results are unevenly worn out tires, generally through the middle of the belt due to deformation. A low resistance manages to pack a lot of pressure, more than a regular tire without deformation and especially making the ride too harsh. Continental’s Conti EcoPlus HD3. 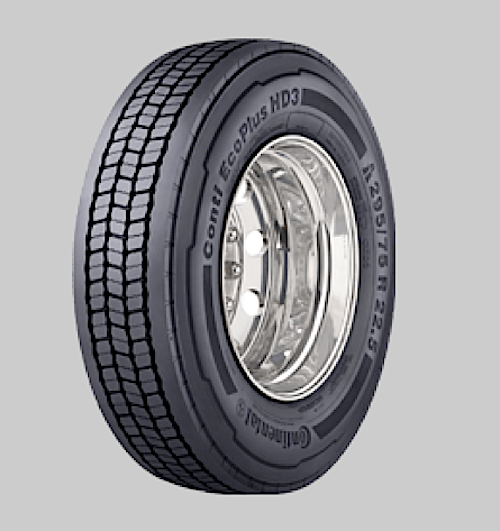 Continental’s Conti EcoPlus HD3 just got verified by the U.S. EPA’s SmartWay Transport Partnership as a low roll resistant tire for Class 8, line-haul tractor-trailers, according to Continental Tire Americas. This is even more important on big rigs where driving hours on end on harsh tires can have devastating results on the driver. Air suspension were invented for big trucks to compensate for harsh rides. The third-generation HD3 tire will be available in sizes 11R22.5, 295/75R22.5, 11R24.5 and 285/75R24.5 sometime in the middle of this year. SmartWay implement verifies that tires do actually reduce NOx emissions and fuel use by at least 3%. Continental now offers 19 new and retreaded truck tire product lines currently listed as verified by SmartWay. As the race continues to make vehicles more fuel efficient, electric and plug-in hybrids are especially turning their attention to every components that can save energy. Tires have evolved greatly over the past decades and lower energy consumption with a higher pressure without impeding on ride comfort has been a real challenge. Today you can chose from many “green” tires that limits the low roll friction a normal tire produces, reducing energy used to move a car.